Sweetie and I have been on Australian TV! Sadly Sweetie couldn’t make it in person but she was certianly mentioned. Here is the link to Channel 7’s Weekend Sunrise. Thank you Samantha and Larry for having me on the show. This weekend I am being interviewed live by Michael McDermott for The Well Informed Traveller . My interview will go out at 7pm Friday night New York time, so take a listen. 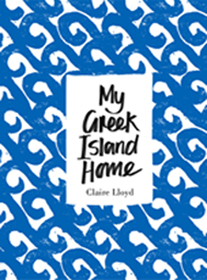 Also the lovely Laura McWhinnie has posted My Greek Island Home on her fab site This Island Life. Thanks Laura! Matthew Usmar Lauder took this photo of Sweetie and I, thanks x. Finally I am sitting down to say thank you M&C Saatchi. 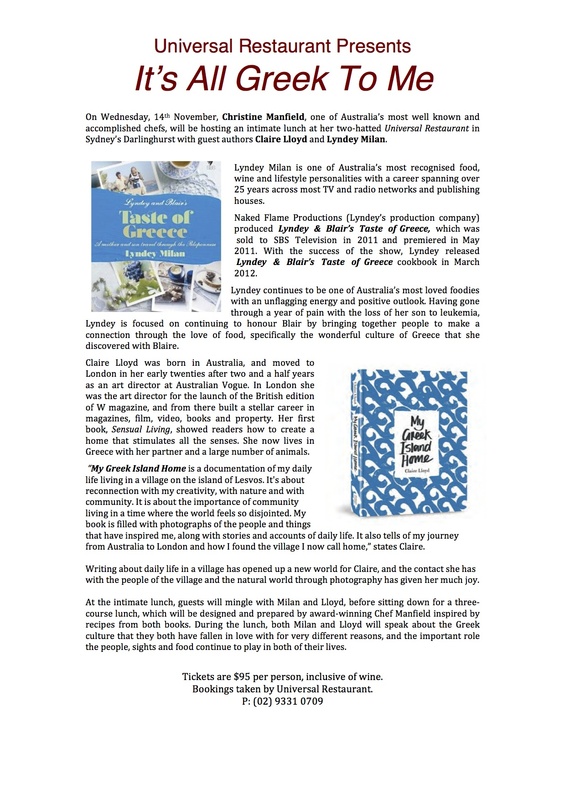 Just before Christmas my friend Tom McFarlane suggested I come into the agency and bring my book, My Greek Island Home to sell in their fab canteen. Tom said it was the perfect Christmas gift. 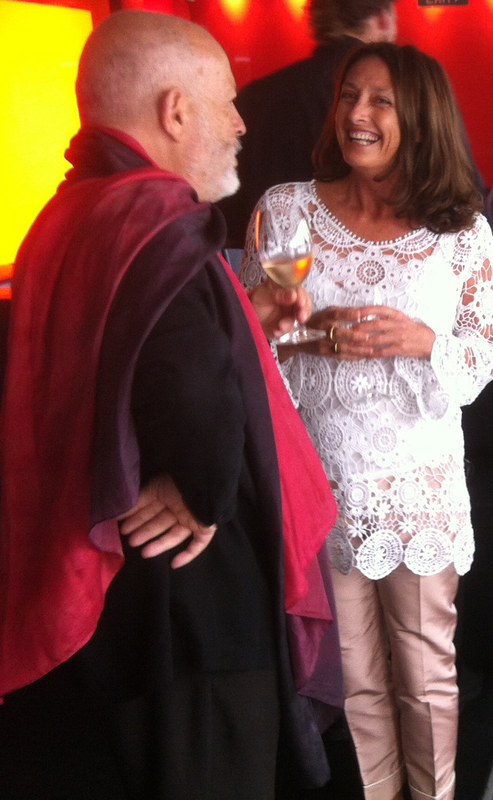 He spoke to the lovely Victoria Uriarte and asked her to come up with something tasty for lunch, with a Greek twist. I set myself up in the corner like a proper saleswoman and enjoyed meeting and chatting to various agency folk that came through the door. It was a lovely thing to do everyone was so friendly, a great atmosphere. The food was just yummie, Victoria really went to town. Slow roasted stuffed leg of lamb, chicken poached in red wine with olives, spanakopita, roasted chat potatoes, roasted sweet potatoes, Greek salad, tzatziki, green beans with almond’s, figs baked in fig leaves with ricotta and honey, honey soaked vanilla cake with sesame seeds and poached peaches with crushed pistachios and honeyed yoghurt. As you can see from the photos there were smiles all around. What a great place to work, if I worked there I’d never go home. Thank you Tom and Victoria and thank you to all those who purchased a copy of My Greek Island Home, I hope you all enjoyed it! 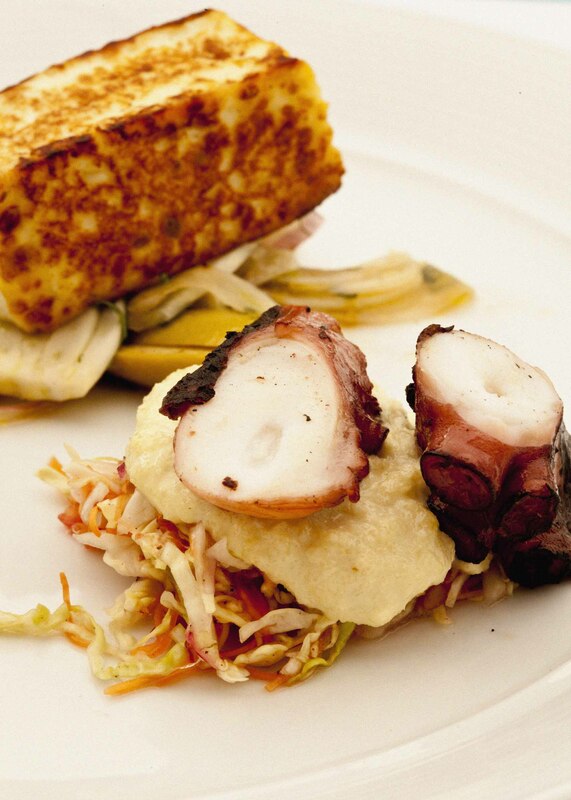 Starter meze plate of zucchini and feta fritters, chargrilled octopus and skordalia, haloumi, fennel,orange and olive salad. 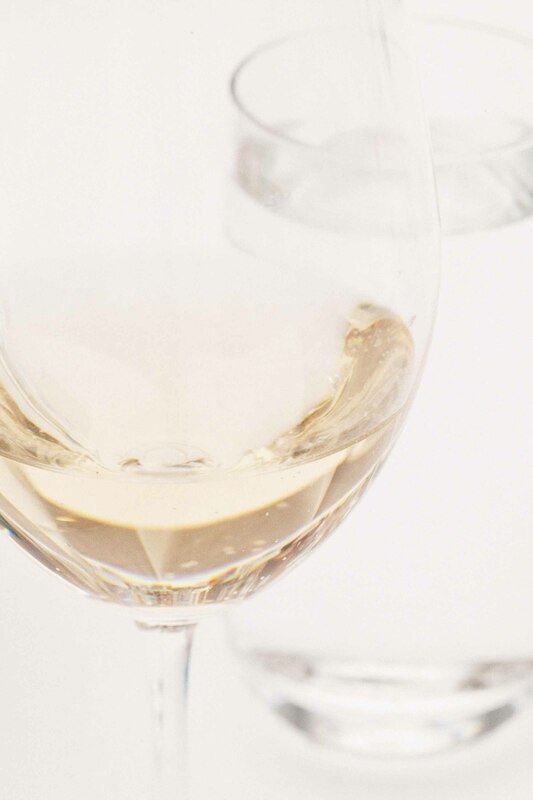 A cold glass of Tselepos Mantinia Moschofilero. 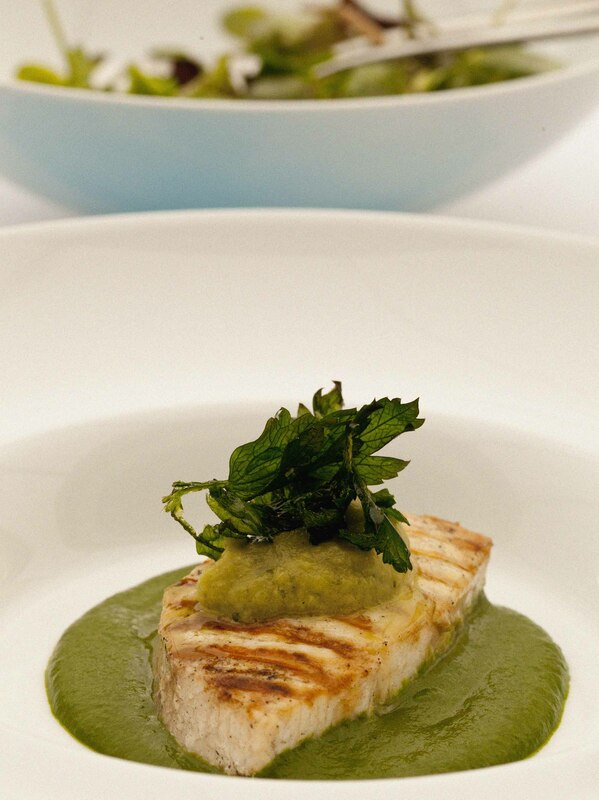 Grilled swordfish, eggplant relish, spinach puree and watercress salad. 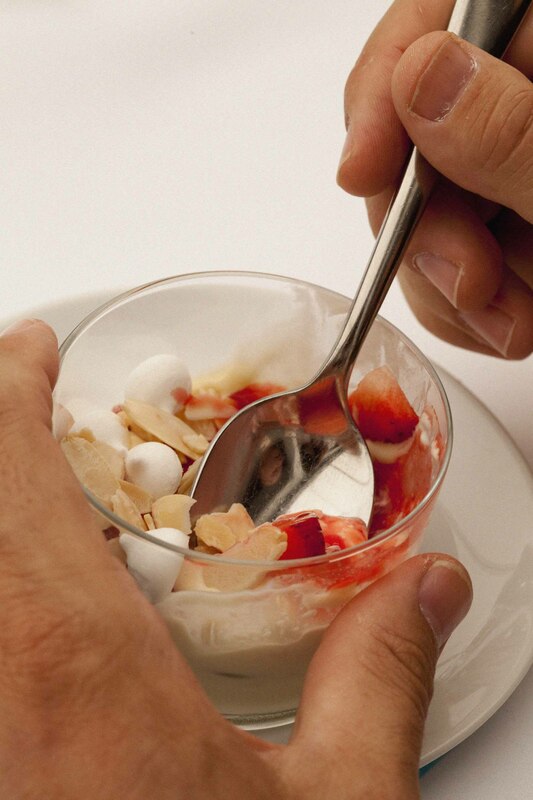 Honey cream, lemon curd, strawberries and toasted almonds. Thank you Chris Manfield for the delicious lunch today and to Lyndey Milan for talking with me. It was great to see everyone there so a big thank you to you ! A great lunch. 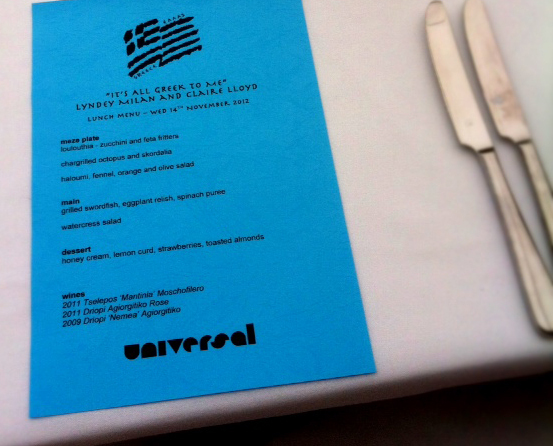 If you love delicious food and love Greece I suggest you book up for lunch at Universal with Lyndey and I. 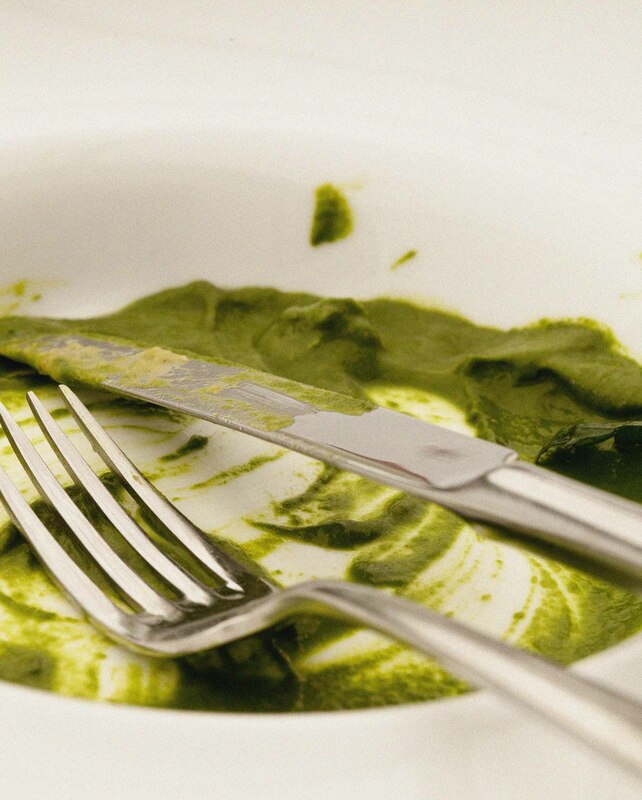 The fabulous Christine Manfield will be cooking up a storm with recipes from both our books. Lyndey and I will be talking about some of our Greek experiences. © Claire Lloyd and Claire Lloyd Loves, 2012. Unauthorized use and/or duplication of this material without express and written permission from this blog’s author and/or owner is strictly prohibited. Excerpts and links may be used, provided that full and clear credit is given to Claire Lloyd and Claire Lloyd Loves with appropriate and specific direction to the original content.